If you live in a multi level house then one thing that you simply cannot escape from is your stairs. Stairs are a necessity, however, this usually means that they are forgotten about when it comes to style and design. Seeing as they are a key part of the house that needs to be used on a regular basis, it makes sense that they could become a focal point of the space. There are a number of ways that you can embrace the beauty of your stairs; one idea is to open them up onto the living area for a spacious effect, and another great way to modernise them is to invest in a new stainless-steel balustrade. Not only are these incredibly strong and durable but when placed into a modern home they look amazing too, creating a definite focal point. It is down to you to figure out what you want to do after that – some decide to have some amazing wall art going up their stairs, whilst others may decide to opt for a brightly coloured carpet. A common theme that we so often see in contemporary interior design is neutral colour schemes, such as white, pale grey and cream. There are so many great things about choosing neutral colours; they can make a room seem bigger, they are easier to work with and you can change your decor easily by swapping the soft furnishings. However, no matter how practical they are, these neutral hues not the most exciting colours to use. So, how can you bring them to life? 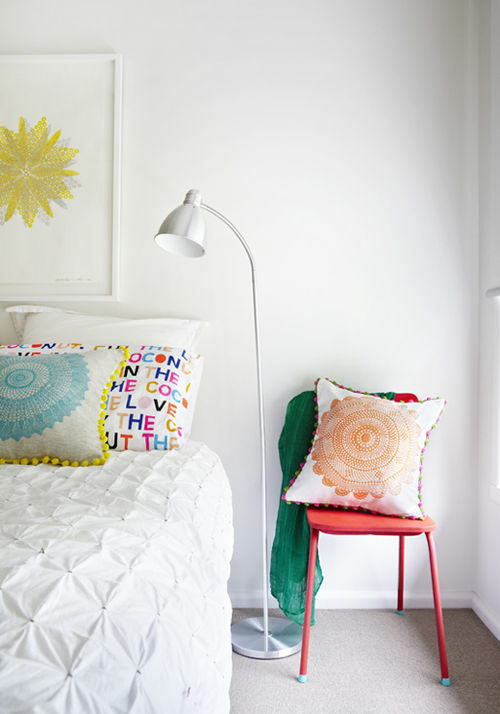 You can add in a splash of bold colour with cushions, rugs, curtains or even the furniture itself. Another great idea is to use prints and patterns to give texture and excitement to the space – I love a good feature artwork. Whilst upcycling old items could really be seen as a vintage approach to interior design, in actual fact, it has become a popular part of modern home design too. Upcycling is when you take an item that’s past it’s best and turn it into something new and impressive. An easy way to do this is with a coat of spray paint to create a smooth, glossy surface that looks ultra-modern. Of course, the piece still retains some of its original charm, but it also looks right at home in your contemporary space. Upcycling is fun to do, allows you to be creative AND saves money on buying new. Many of us love our gardens but it isn’t always possible to spend as much time as we would like in them. This is why so many modern homes are taking the approach of bringing nature into their indoor space. Plants are not only great for all the family to care for, but they also bring a real sense of colour and texture to your home too. As well as this, plants are great for the air around you, as they help to clean and purify it – you can read more about the health and happiness benefits of plants in my recent blog post. Why not consider a ‘living wall’ or at the very least you can hang some planters in your kitchen for a burst of colour and freshness. Sometimes in order to get your house looking just the way you want it to, you need to play around with the different options open to you. You may wonder whether a particular colour will work in the space but the truth is that you never know until you try! Why not give the style that you like a chance? You may be surprised by a bold monochrome pattern or an exciting texture like steel or glass and be glad that you tried it out. Contemporary style isn’t about creating a decor where everything matches, so take the opportunity to experiment and come up with your own style. I hope these ideas have given you inspiration for decorating your own home and well help you decide which elements of contemporary interior design will suit your style. Let me know if you’re currently decorating your home and what plans you have, I’d love to hear from you in the comments below.